Time to get moving. This versatile car rack is portable, sturdy, and soft. 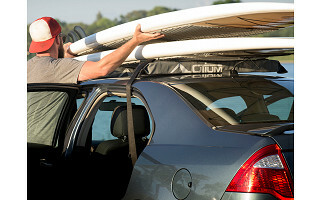 Constructed with foam and canvas, the Otium SoftRack is much lighter than typical plastic roof racks. The design is still plenty durable, though. It easily handles up to 165 pounds of whatever you need to haul. The extra-strength straps span the roof, weaving through reinforced loops on the foam racks. Use whichever loops you need to secure your cargo—a kayak, skis, a surfboard, a ladder and more. Then fasten the straps securely inside almost any four-door car, but drive under the recommended 65 miles per hour to keep you and your stuff safe. For next time, the racks pack down compactly into a slim carrying case, perfect for stashing in your trunk. 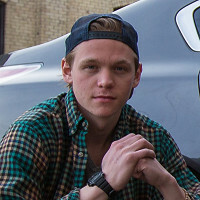 Founder Connor Mooney—an avid skier and snowboarder—was tired of cramming equipment into the backseat of his car. Instead of shelling out hundreds of dollars for a traditional roof rack, he designed the SoftRack. Whether you need to move outdoor gear or everyday items, this adjustable car rack has it covered. Hello everyone! I'm proud to introduce Otium to The Grommet. I'd be happy to answer any questions you have! What was the inspiration behind Otium? Its creation stemmed from the inability to transport a number of different items with a universal rack, that's also easy to remove and assemble. We wanted to create a rack that didn't take up a lot of space and would allow users to seek more adventure with friends and family by giving them their space back. ?The SoftRack started as a class project when co-founder Connor Mooney was in business school, and has since evolved into an outdoors brand inspired by innovation and adventure. What sets this rack apart from others people may have now or may look to buy? For one, our team contains two highly sought after bachelors (at least we like to think so). After that, it comes down to the technical details that were carefully engineered and tested by some of the toughest critics that really set it apart. This thing is tough. Each SoftRack features double stitching on each seam to prevent internal corrosion, a resilient foam that can be bent and battered yet maintain its shape over time, and water resistant straps that eliminate water from seeping into your vehicle during storms. All this is packed into a travel friendly four pounds! What audiences do you see Softrack resonating with the most? The beautiful aspect of the Otium SoftRack is that it resonates with just about anyone. Whether you’re an outdoor adventure who needs to transport their kayaks or an Instagram DIY master that needs to transport lumber and ladders, this rack will accommodate those needs with ease. It’s a four-season car rack that won’t limit your capabilities and doesn’t require any additional tooling or accessories. Best of all, it fits most vehicles and is on or off in minutes. What does it mean to you to be launching on The Grommet and what do you expect the feedback from the community to be like? It means the world to be launching on a platform that truly cares about its community of makers. We’ve been following The Grommet for some time and have noticed the products that debut on their site are incredibly innovative and inspiring. Our team is really excited to interact with The Grommet supporters on the comment board and tell our story, answer questions and receive constructive feedback. We want the community to challenge our product. Based on the reviews and feedback our team has received from our current user base, we are confident in launching our product on the Grommet and helping change the way people transport gear. Is there a version for a 2 door car? I have a older Civic and I have been looking for a way to carry 1-2 Kayaks. @Erin Hey Erin, thanks for your question! The Otium SoftRack is compatible with most two-door vehicles depending upon the make and model. However, we do recommend a four-door vehicle when transporting a kayak. Is there a way to secure luggage to the Otium? @Judy Hi Judy! Yes, we have used the Otium SoftRack to transport luggage and it works great. The best and most secure way to do so is by weaving the security straps through your handles, or any available straps, on your luggage. Also, it is best to make sure the blocks are spaced in a way that leaves a couple inches of overhang on each side. Hope this helps! I have a friend who just bought a Prius (standard model) and wants to find a cartop carrier that will handle his canoe. Would the Otium work on a Prius, and would it hold a canoe of well under 165 pounds? @Michael Hey Michael! The Prius model has a curved roof so we always recommend adjusting the blocks so that the straps do not interfere with the driver or passengers' heads and driving ability. When transporting canoes, or larger objects, we STRONGLY recommend tying down the front and back of the canoe to the frame of your car for extra security. Hi! Would this work with bikes? @Reni Hi Reni! Fantastic question. Currently, the Otium SoftRack does not carry bikes. As avid cyclists from Minnesota, I can tell you that we are working on creating a solution that will allow users to transport their bikes more efficiently. Is the rack wide enough to tie down 2 kayaks side by side? @Alan Hey Alan! The Otium SoftRack works great for one kayak. While we have had users transport two kayaks, this usability is determined by the make and model of your car. Depending upon the size of your vehicle, the straps may or may not safely wrap around your vehicle for a secure attachment. Again, we would recommend tying down the front and back of your kayaks for additional security. Cheers! Thanks Ben, I have a 4 door sedan: Lexus ES300h so it's not a wide SUV or truck. Also, would I strap the Kayaks to the rack with different straps or the ones that hold the rack itself to the roof of the car? I did buy a Thule rack system but am not happy about taking off and on all the time. This soft system, if wide enough would be my first choice for sure. @Alan - Thanks for the response. You will be able to secure one kayak with the 4 door sedan. You will use the same straps to secure the kayak and the rack. It is an all-in-one system! Will this also be able to be attached to roof rack rails on a SUV to provide cross rails? @Tammy instead of having straps go inside door? @Tammy Hey Tammy! Thanks for your question. Yes! If you have elevated rails that run along the side (front to back) of your car, you can absolutely use those instead of going through your doors. In fact, as long as you take time to properly secure the straps and your equipment, we actually recommend using the rails. Hope this helps! Does it damage the rubber at the door opening of the car when you have to repeatedly tighten it down? @Nancy Hi Nancy! For all of the vehicles we have tested the Otium SoftRack on, we have not run into the issue of damaging the rubber weather stripping. As long as the SoftRack is correctly secured (i.e. the metal buckle is not in the door frame) this should not be a problem. How would it handle something within its weight range but slightly oversize, say a 12x 8 pipe fence panel? Would it be stable enough to go 30 miles? @Nancy - The straps that come with the Otium SoftRack are 10 feet long, so they will not be able to make it around the fence panel. However, if the straps are able to go through the fence panel and safely secure the panel down, this should not be a problem. Again, when transporting larger equipment we strongly recommend tying down the front and back to the frame of your vehicle for extra security. How well would this work for loading 2 stand up paddle boards on top of a Ford Explorer? @Judy - Yes, the SoftRack is a great solution for loading SUPs! You can check out some of the photos we have showing the SoftRack hauling 2 SUPs on the product page at https://www.thegrommet.com/otium-outdoors-softrack. It's extremely compatible with SUVs such as the Ford Explorer. Thanks for the question! I have a Prius, how many snowboards could this hold? Also, does the canvas scratch the paint? @Adam - With a 4-door Prius, the SoftRack is able to transport three snowboards. Each SoftRack set comes with a micro-fiber cloth that we recommend using before securing the blocks to the roof of your car to get rid of any dirt or dust that may scratch the paint. @Tristan Hey Tristan! We're happy to hear you're loving your SoftRack. Thanks for your support! Will this work for mini-vans with sliding back doors? @Maxine Hi Maxine! Unfortunately, the SoftRack is not compatible with a mini-van or vehicles with sliding doors. However, if your mini-van has rails that run from front to back with separation between the rail and the roof, these will work great for the SoftRack because it doesn't go through the car. Thanks for your question! @Ben shoot! there seems to be no solution for a mini-van without a roof rack! Thanks for your answer. DOES IT WORK AS A BIKE RACK, TOO? Unfortunately not, Susan, but it appears to be in the Otium plans! Have you tested this with a newer Jeep Wrangler 4 door with hardtop? There is nothing close to this $$ in the market. @Richard Hey Richard! Yes, the Otium SoftRack will work great with your Jeep Wrangler. Thanks for reaching out! Time to get moving. This versatile car rack is portable, sturdy, and soft. 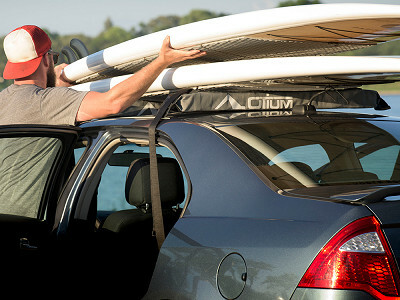 Constructed with foam and canvas, the Otium SoftRack is much lighter than typical plastic roof racks. The design is still plenty durable, though. It easily handles up to 165 pounds of whatever you need to haul. The extra-strength straps span the roof, weaving through reinforced loops on the foam racks. Use whichever loops you need to secure your cargo—a kayak, skis, a surfboard, a ladder and more. Then fasten the straps securely inside almost any four-door car, but drive under the recommended 65 miles per hour to keep you and your stuff safe. For next time, the racks pack down compactly into a slim carrying case, perfect for stashing in your trunk. Founder Connor Mooney—an avid skier and snowboarder—was tired of cramming equipment into the backseat of his car. Instead of shelling out hundreds of dollars for a traditional roof rack, he designed the SoftRack.